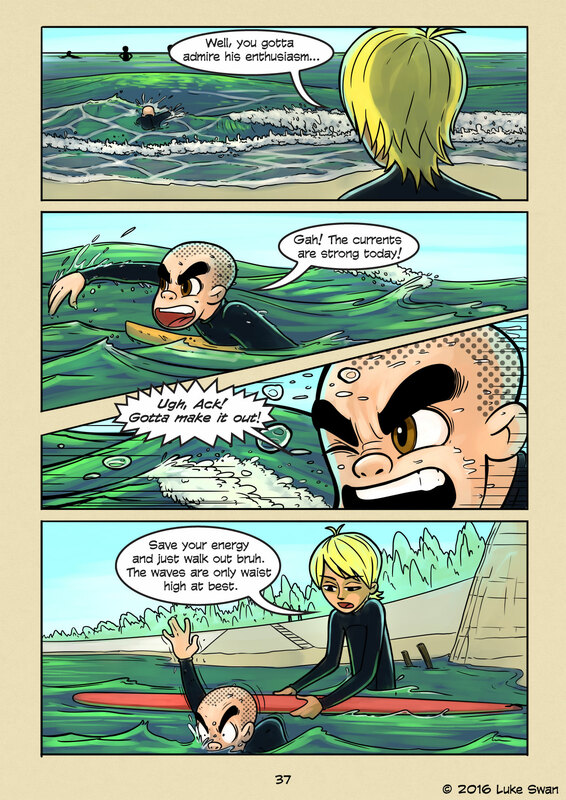 Strong Currents (#037) | Web comic "Surfer Joe"
Wave’s push water up onto shore, and then the water goes back out to sea. But it can’t go back the way it came, so it funnels to the nearest channel. All the water flowing through the channel creates a current. Experienced surfers use currents for an easy paddle out to the lineup. They know what they look like, and how to enter and exit them with relative ease. The general principle is that the currents are where the crashy waves aren’t. Take current out, ride crashy wave in. Rinse and repeat. Currents can be pretty scary if you don’t know much about them. If you get caught in one and don’t know what to do. The instinct is usually to try and paddle to shore, but that is the worst thing to do(besides panicking, but the two usually go together). Paddling against the current is only going to wear you out. Better to ride it out. Or better yet, paddle parallel to the beach until you’re in the crashing waves and ride one in. What makes beach breaks so tricky is that the ocean floor is made out of the sand. Sand shifts and as the water moves around it. New channels form and dissipate. This makes the waves and currents harder to predict than if you are surfing over reef or point breaks. You have to stay on your toes more too. I’ve had a current form around be(it’s actually pretty common). I’ve been stuck in between the current and the breaking wave before. Now that’s scary. The current pushes you into a wave that sends you back into the current. This will repeat until you get out or drown. It usually happens near a jetty, but it can happen anywhere. Just remember to paddle parallel to the beach! I’ve been caught in sweeping side currents. Those are weird and I don’t quite understand how they work. You’ll be paddling out at the carpark, and end up a kilometer down the beach a minute later. I think they happen when the swell is coming from an extreme angle. Once you understand them they can be fun. I remember one time I was exhausted from paddling and duck diving into the break zone. It was a fairly heavy day, but I thought I could punch through it. When I finally wised up and found the current, it was so strong I just sat on my board and it took me straight out. I was too tired to paddle and was thinking of throwing in the towel. But I got lucky.